This month - Merchants buy into Main Street, helping hands for Mockingbird’s Whitney, parking lots get a closer look and Lisa Monti gets the low-down on Dan B’s return to the beach. The building at 201 Main Street, is one of three properties that have been recently purchased by the shop owners. "Social Chair" is an old town anchor and owned by designer Yuki Northington. 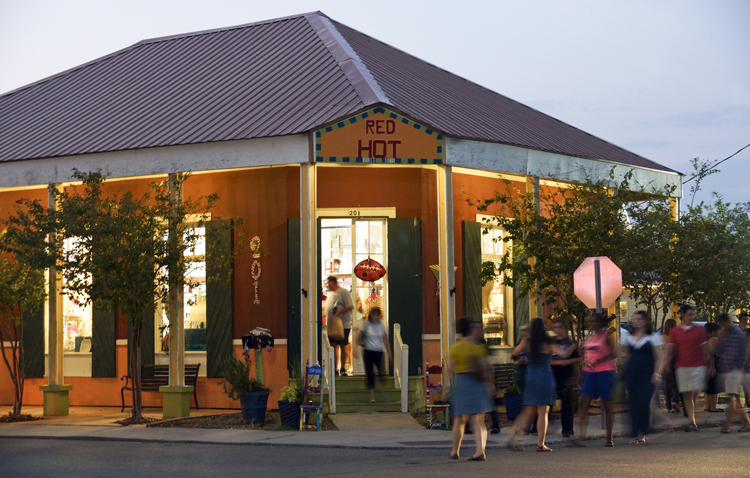 In recent weeks, three Old Town merchants have purchased their buildings, becoming commercial property owners rather than tenants. 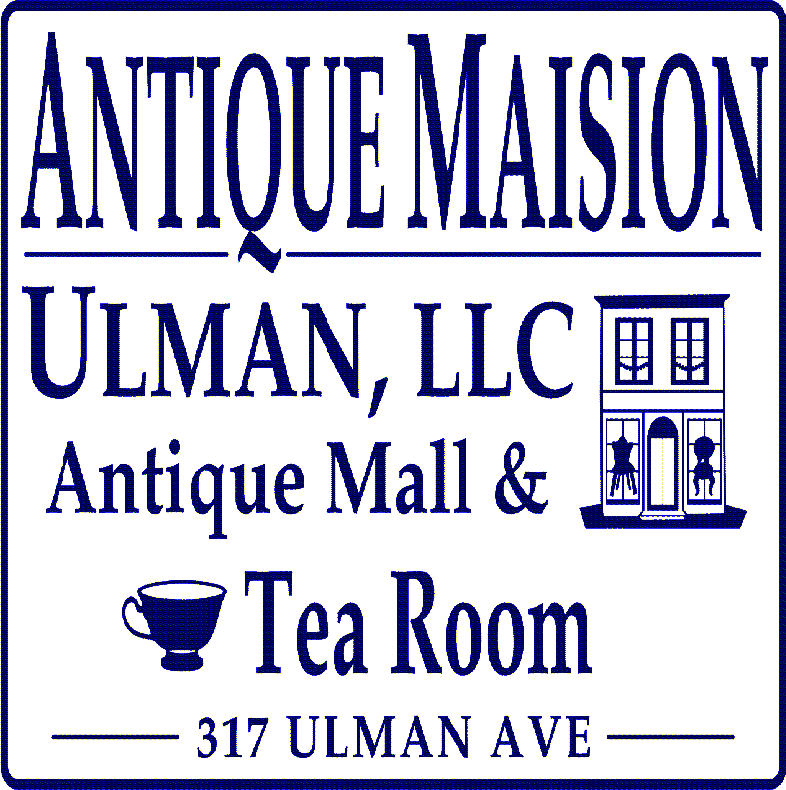 The businesses are Social Chair (on the corner of Second and Main Street), Magnolia Antiques and The French Potager. The properties were part of the Harold Carver estate of eight Main Street properties and were listed for sale in June of this year (read the article in Lisa Monti's blog). A fourth business, the Starfish Cafe, is planning on purchasing their building as well. Martha Whitney Butler, owner of the French Potager, says that as a first time property owner, she's "exhausted and exhilarated in the same sweet moment." Linda Keenan, the owner of California Drawstrings, recently purchased and restored a building on the second block as well, at 216 Main Street. The popular business has maintained a location in the New Orleans French Quarter for 28 years. "We have a great team now on the second block of Main Street," says Whitney. "I'm proud to be part of the renaissance of Bay St. Louis." 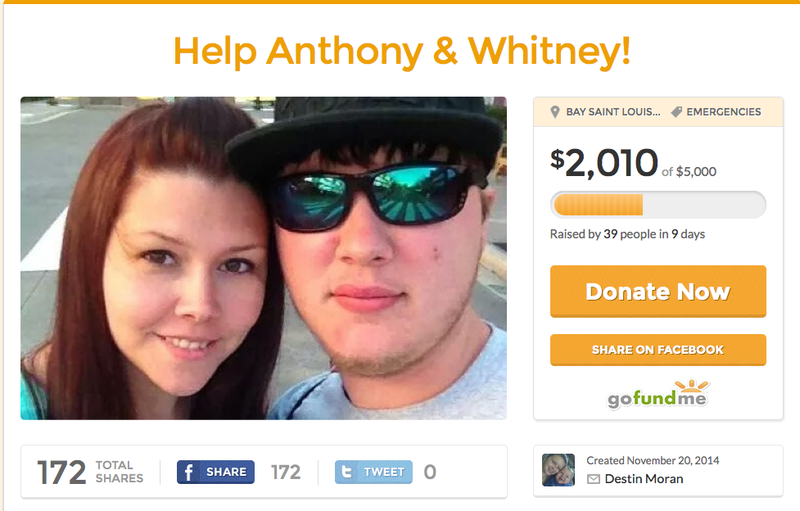 Anthony & Whitney Lafrance lost their home last night in a fire! They are safe but they lost everything! Please help donate money to them especially right before the holidays & help raise their spirits! God bless! Anyone who frequents the Mockingbird Cafe knows the smile of Whitney, one of the long-time baristas there. Mockingbird owner Alicein Schwabacher says that many have been concerned and want to help the young couple and the cafe is planning a special event on Second Saturday to benefit Whitney. To donate via GoFund, click here. At the Mockingbird, they're keeping a jar for cash donations and have set up a banking account that you can deposit into directly. Just ask anyone there for the account number. UPDATE FROM LISA MONTI, 12/3/2014 - Downtown merchants prevailed at last night’s Bay Council meeting, saving the public parking lot they consider a tourism asset. After hearing several pro-parking lot speakers, the council voted unanimously to reverse the decision to surplus the parking lot on Main Street behind the former City Hall Annex/Chamber office. Read Lisa's report here. The Hancock Chamber recently sent out a survey to members asking how they felt about a recent decision by the Bay St. Louis city council to surplus the city parking lot across from Bay Books in the 100 block of Main Street. At the November 18th meeting of the Bay St. Louis City Council, the council voted 4-3 to surplus the public parking lot between 111 Court Street and Main Street with Wendy McDonald, Doug Seal and Lonnie Falgout voting against the action and Mike Favre, Joey Boudin, Bobby Compretta, and Jeff Reed voting in favor of the action. There is also discussion on whether the city should surplus the public parking lot on Beach Boulevard at the French Settlement building. 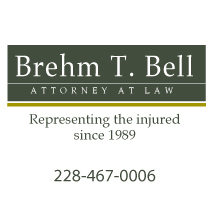 Surplus properties can then be appraised and the City of Bay St. Louis can decide to sell or not sell the properties. The survey results will be presented to the Bay St. Louis City Council at the Tuesday, December 2nd meeting at 5:30pm (City Hall Conference Center - 598 Main Street). The survey can't be taken by non-Chamber members, but if you'd like to ask questions or voice your opinion click here for Council contact info. The possible sale of the parking lots was also discussed at the November Old Town Merchants meeting. One merchant quipped after the meeting, "It's not even really a controversy, it's so one-sided." 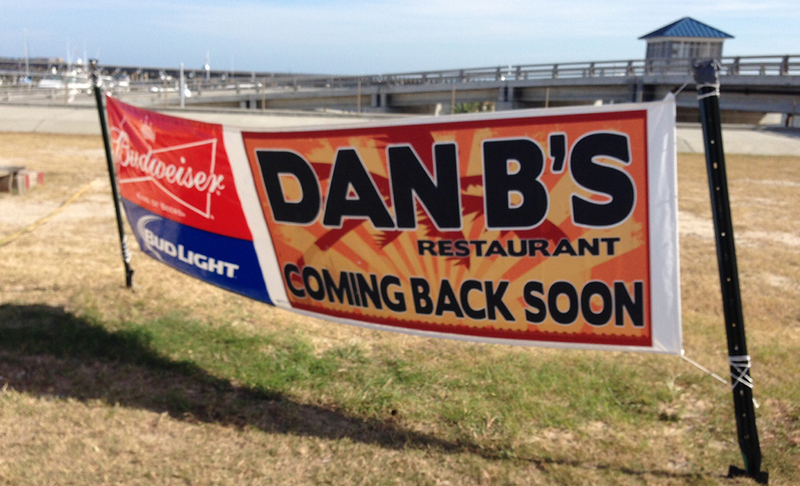 The Murphy family plans to open the new Dan B’s on the Bay St. Louis beachfront in about six months. The location is the same as pre-Katrina Dan B’s but the look will be different. “The theme is like a Gulf Coast fish camp,” Ken Murphy said. The structure will have a simple design and construction will take about 90 days to complete. “We hope to be open by May,” Murphy said. 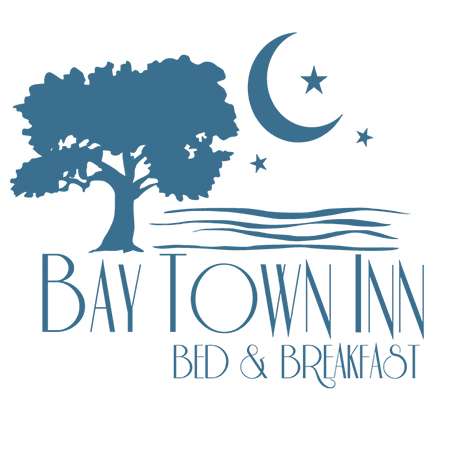 Know something exciting about Bay-Waveland that belongs in the Big Buzz? Let us know by using the form below!